Isiilde is a young nymph who is destine to be sold into service once she comes of age. As a royal nymph, the emperor’s daughter, she will fetch a hefty price. Isiilde has one problem though….she can’t help but catch things on fire! When she catches the royal nursery on fire with the heir’s in it, by accident or course, the emperor has no choice but to send her to the dungeon. That’s when Oen steps in and saves Isiilde from the dungeons. He begs the emperor to allow him to take her to his home island until she comes of age. Reluctantly, the emperor agrees but he plans on keeping a watchful eye on his most prized financial investment. Flash forward a few years, Isiilde is now sixteen and rapidly intoxicating anyone who crosses her path. She struggles to understand and control her powers and still randomly sets things on fire. What unfolds next is a rich story about a woman struggling to control the fire within herself while three different kingdoms battle for the right to claim her as their own. I love high fantasy, sadly my expectations are very very high after reading such series as A Song of Ice and Fire series, The Grisha series, and The Sword of Truth series. I have not read a lot of epic fantasy with nymphs or similar creatures. For me personally, I prefer high fantasy that is more in line with Medieval style history. However, I agreed to review this novel and went into it with an open mind and here is why. High fantasy is a genre dominated by male writers and this novel was written by a female. Flynn’s attention to the world of Fyrsta was phenomenal. I loved the map at the beginning. Very detailed and easy to understand. I referenced it often and enjoyed reading about the different locations and realms. I did struggle to get my bearings for about the first quarter of the novel. I thought there was a little too much going on linguistically. I loved the prose, it was romantic and complex which either within the novel nicely but I was a little bogged down by the different names not only for the characters but their cultures and regions as well. It’s hard for me to engage with the characters when I don’t know how to pronounce their names. It would be one thing if one or two characters had names that I didn’t know how to say but almost every character, region, and culture had names that I couldn’t pronounce which weighted me down while reading. With a lot of high fantasy novels, there is a lot of time spent building the world, lore, culture, and creatures etc and often not a lot goes into the story or if it does then it happens late in the novel. This is often why high fantasy novels are so lengthy. I loved that she didn’t spend too much time creating the world. Some times I felt like it needed a little more time to create the world for example, there was a lot of lore at the beginning that was referenced but not explained right away which was a distraction because I couldn’t find a context for the lore right away. Eventually though Flynn explains it for the reader and I was able to follow along and understand it but I personally would have liked to have seen it explained immediately. She gave the reader just enough info to get acquainted with the world and navigate the story while she spent the bulk of her time building the characters and the central story line. I loved that she got right to the meat of the story rather than fill up 500 pages with world creation. Once I got my bearings it was an easy story to follow and enjoy. I loved the richness of the setting and characters. I especially enjoyed Isiilde’s character. She had the perfect mixture of sexuality and innocents that only a women writer can create. The story ended at a great point, it left me wanting to read the next installment. The central story concluded nicely and left enough to segway into the next novel which is difficult to do, bravo! 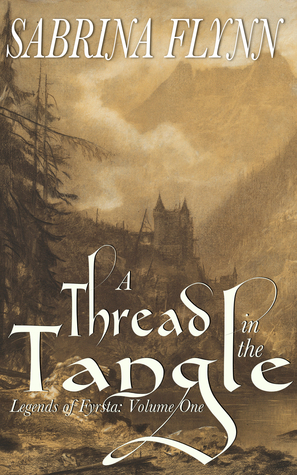 Even if you aren’t a fan of fantasy literature, I still think readers would enjoy this novel. It’s got a lot of familiar themes from traditional literature, such as feuding kingdoms and emperors struggling for power etc. If you are thinking a bout reading fantasy, particularly high fantasy, for the first time then this is a nice place to start. As a female fantasy reader, I liked that this was written by a woman and it wasn’t overly bogged down with the world which left more time to focus on the characters which for me, made this a wonderful read!